Faith in Nature… what can I say? I love this brand… I have tried all sorts of products from their range and they’ve all been great. 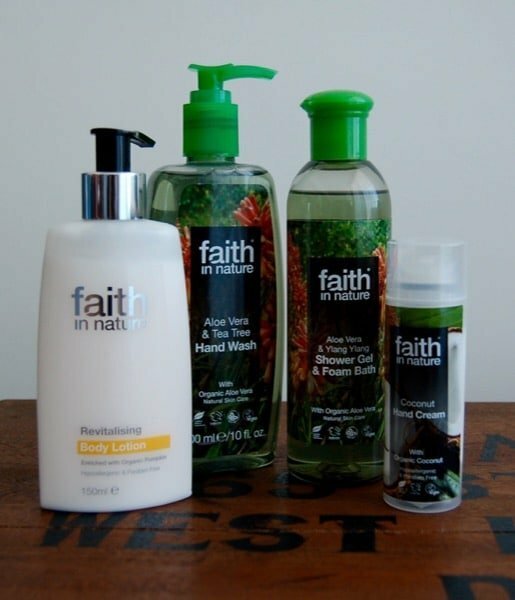 Faith in Nature is a British brand that is of course natural and uses certified organic ingredients, is vegan, cruelty free, award winning and of course no nasties in sight, not anywhere. I have to say I used to be a bit cynical about natural body lotions – I’ve tried a lot and never (until I started writing these posts anyway) had very good results before. But I guess that’s the thing isn’t it – natural products have come a long way in the past few years. I chose the Revitalising Body Lotion from Faith in Nature and this stuff is lovely… It’s creamy and though it feels quite thin (this is something I’ve noticed about a lot of natural lotions), it slides on well and as well as smelling delicious, really sinks into my very dry skin leaving it feeling so moist, smooth and plump. I have been really happy with it. With such dry skin it’s always been hard to find a product that actually worked and improved the condition of my skin but I’m happy to say I now never need to seek the services of another non-natural product again! Hurrah! I could waffle on for ages about how much I love these products, but I’ll try to keep it brief. The Aloe Vera and Tea Tree Hand Wash is simple – it did exactly what it was meant to. I wasn’t sure I liked the fragrance at first as it’s very noticeable but Mr Arabian Notes commented that he really liked it as it smelt very clean. I should also say that this is a good thing since he works in the medical profession and is therefore particularly attentive to hand washing hygiene and using good products. The Aloe Vera and Ylang Ylang Shower and Bath Gel is something I had forgotten that I’ve actually reviewed before… I love the smell of it, the bottle lasts for absolutely ages and it does what it’s meant to all whilst leaving my skin – well, just the way it’s naturally meant to be! It makes for a lovely natural bubble bath too – I used it a lot for this purpose when I was pregnant with Baby Arabian Notes to help soothe my aches and pains! The Faith in Nature Coconut hand cream is another cream that feels thin and sort of wet, though not sticky on application. It may sound a bit mad to say it sounds wet, but you know what I mean, quite watery feeling which you don’t expect from a hand cream. All the same it moisturises my hands well and smells divine. The one thing I’ve learned whilst trying out natural products though is that they don’t feel the same as the unnatural products with chemicals out there… and when you think about it, it’s pretty obvious that they don’t – they’re all natural and not full of silicones to add sheen, or chemicals and nasties to make them absorb into your skin. Think about that – the one thing I’d say to people when using natural products is that you need to give them a chance to work, they are different and it will take a few days at least for your skin to adjust to something new – but this is a good thing and if you stick with them I promise you’ll start to see how they work. I love me a good lip balm as you’ll know if you’ve read these posts before, and I’m a sucker for trying new ones! 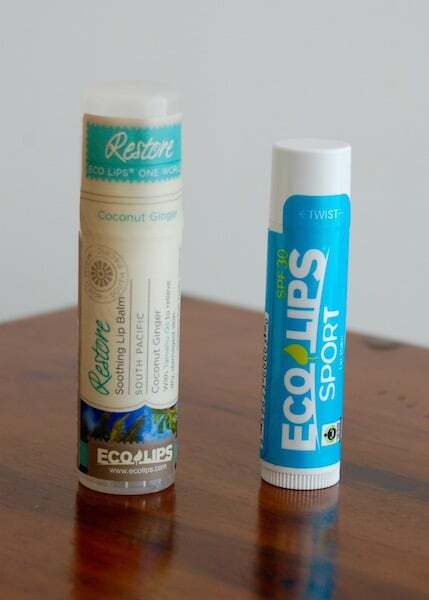 Both of these are by Eco Lips. The second one I have to say I haven’t used nearly as much but it is my balm that I grab for a day at the pool or beach. It hasn’t yet melted in the heat here into a gloopy disaster and I haven’t ever ended up with burnt, peely lips (yes, that I can confirm is a thing in case you’re wondering). I bought all of these products here in the UAE from Treehugger Company which has become one of my favourite one stop shops for natural products. UPDATE JULY 2017: Although their booth in Abu Dhabi has now sadly closed, you can still buy from them online with free delivery.